The Brookwood is a newer (2009) condo tower in Midtown. These modern residences feature many luxurious touches including built-in refrigerators, rich wood cabinets in the kitchens, Viking appliances, granite counters, marble and tile baths, wide plank hardwoods and private terraces. The amenities list is long and includes a fitness center, saline pool, outdoor kitchen, coffee station, guest suites, underground assigned parking and available concierge services. The Brookwood is also the first LEED-Certified high-rise condo tower in Atlanta. 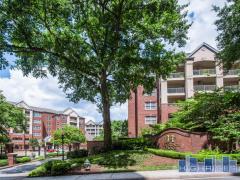 Click Here to see condos for lease at The Brookwood. This fabulous high-rise building prides itself on offering unsurpassed amenities. The lounge furniture welcomes residents to gather by the outdoor fireplace and the building even has a separate clubouse, rather than a traditional condo clubroom. Brookwood (Brookwood Hills) is a historic intown neighborhood located between Midtown and Buckhead. Home to about 1000 people, it was founded in the early 1920s by Benjamin Franklin Burdett and his son, Arthur. The site of the neighborhood is located where some of the bloodiest battles of the American Civil War took place. Burdett first created the neighborhood on the Battlefield of Peachtree Creek owned by himself and local Thomas Collier; this area is now registered as the Brookwood Hills Historic District. They built the streets in accordance to the hilly terrain, instead of the standard grid form and the oak sapling trees that are now a trademark of the neighborhood were planted there by Mr. Burdett. Because of its central location, Brookwood has faced a lot of pressure from the metro Atlanta expansion. Efforts to develop the area such as a Marta station, industrial park, and a new high-rise were stopped thanks in large part to the strength of the Brookwood Hills Community Club (BWHCC). The homes in Brookwood have maintained their 1920s charm. The mostly older homes here have almost all undergone renovations and stayed true to the period, but there are also a number of newer homes available as well. Have any comments or questions about The Brookwood Condos? Ask your question and/or share your thoughts about this Building. Do have rental properties avail.is so, fee and is it quiet?